It's easy to overlook the seemingly nondescript trees that often line the land found between the sea and the coastline. These trees don't grow fruits or nuts, nor are they ideal for shade or breeze, but what they do have to offer far surpasses all of the above qualities. 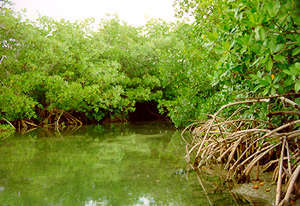 Mangroves, trees unique for growing in seawater, grow approximately two feet in the first year, fast relative to other species of trees. The three species of mangroves found in Belize begin to grow from what are called propagules, which are seed pods that grow on the end of roots that drop down from a tree. As the pods ripen, they fall into the mud and roots form that eventually become a new tree. Across the globe the location of mangroves usually runs parallel to coral reefs. The relationship between the two is clear: mangroves thrive in brackish, nutrient-rich waters, while coral reefs thrive in clear, nutrient-poor waters. Mangroves act to purify the water from human wastes and pollutants, and in doing so, coral reefs are less effected. An essential component of the island ecosystem, mangroves provide structure to the island, while preventing erosion. The coastline is protected because the roots of mangroves act to trap sediments that would otherwise be washed back out by the waves. Moreover, mangroves provide a habitat for many different species of animals, including bats, lobsters, manatees, and birds. The roots and branches of mangroves provide an ideal site for animals to feed, mate, and give birth. A symbiotic relationship exists between many animals and the mangrove; for example, crabs feeds on the mangrove leaves, as well as other nutrients and then recycle minerals into the mangrove forest. Despite the significant importance that mangroves have on the environment, they are currently experiencing a major threat: clearance. This trend is increasingly apparent in Belize, especially on Ambergris Caye. As the demand for coastal settlements and development continues to increase, so does the elimination of this essential habitat. Sea walls are often put up in their absence, in an attempt to prevent erosion, but ironically, the opposite occurs. This sets off a chain of events that adversely effect the coastal ecosystem and are often irreversible. Without a permit granted by the Department of Fisheries, the clearance of mangroves is illegal. Unfortunately, regulations are insufficiently enforced. Today, the future of mangrove forests hangs in the balance, but Green Reef is working to prevent further illegal clearance by both increasing awareness of this valuable ecosystem and increasing the number of mangrove protected areas.